Hearne Line Marking specialises in all types of line marking, from road marking and car park marking to sports facilities and playgrounds. 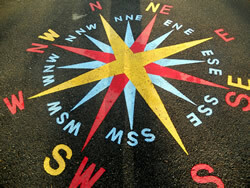 We are based in Co. Wexford, but provide line markings and road markings in all areas of Ireland. As well as providing a complete range of road marking, we also do road studs (cats’ eyes), both permanent and temporary. All our staff are trained and experienced, to fulfil your line marking requirements in a safe and professional manner. If you have existing line markings, these can be removed prior to your new lines being painted. Our client list includes public sector organisations such as county councils, hospitals, schools and universities. We also work with supermarkets, freight companies and ports who need line marking for parking bays, health and safety road markings and more.